Five of us stood on a large rock outcropping just past Devils Peak on the PCT in southern Oregon. 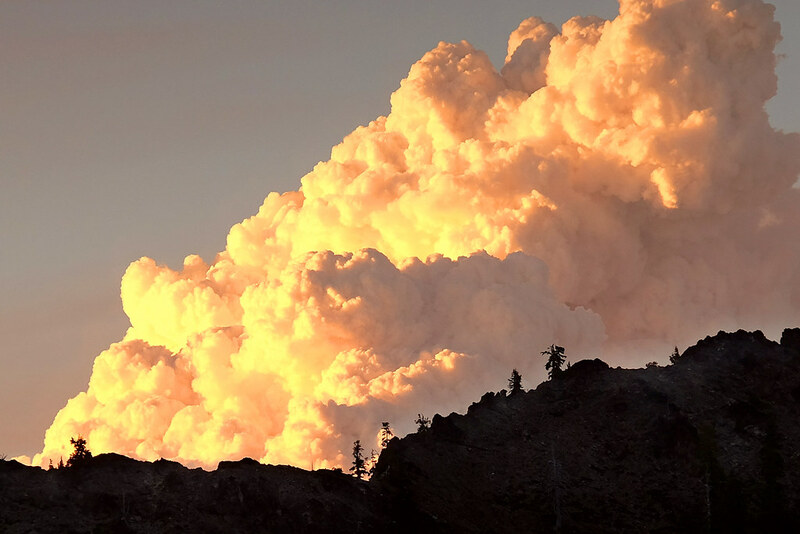 As I watched, a large cumulus cloud hovered over the next ridge between us and our planned destination that day, Mazama Village in Crater Lake National Park. The top of the cloud looked like a giant cotton ball. The bottom was a smear of gray. As I watched, the cotton ball grew but stayed atop the ridge where I had first seen it. My jaw dropped involuntarily as all this sank in. I glanced at my hiking mates. None of them had any idea what they were looking at. A major fire was taking off right in front of us, potentially blocking our path into Crater Lake 24 miles away. I had to tell them we were about to hike into an extremely dangerous and rapidly expanding wildfire. 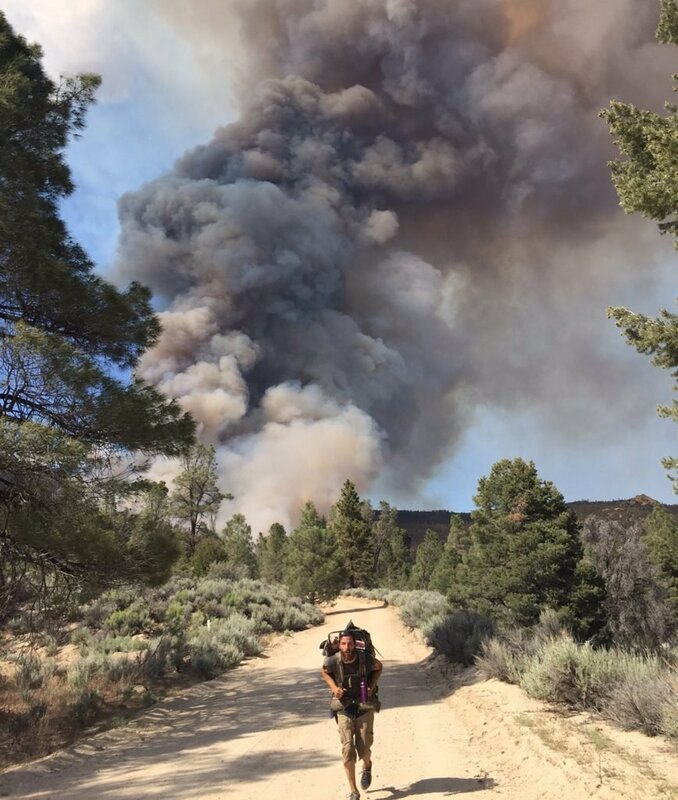 A PCT thru-hiker sprints away from the Chimney Fire. Photo by Elliot Schwimmer. I was a firefighter with Cal Fire for my entire adult life. By the time I stood watching the column of smoke build in the distance, I had already attacked more than 2,000 wildfires, so I knew exactly what I was looking at. It dawned on me that my fellow trekkers on the PCT could probably use a few tips on dealing with wildfires while hiking. Please understand that these recommendations come from years spent on fire lines all across the West. Register lakes, ponds, large slabs of clean granite, large meadows with few trees and little vegetation, or large, open spaces with little or no vegetation. If you hike into a wildfire, the refuges you just passed might save your life. Keep a sharp eye on your surroundings. Even in dense forest, if you are hiking in clean air and find yourself entering smoke, especially dense smoke, turn around and go back into the clean air. Don’t stop there. Keep going back the way you came until you find a location that offers protection from fire. I know this one is tough, but if you walk into a fire, all it takes is a gust of wind and you’ll find yourself incinerated. If the smoke column is well off the trail and not the direction you intend to take, proceed with extreme caution and watch the column. Wind can make wildfire change directions in an instant. Usually, fires are pushed by prevailing winds (southwesterly flow in the west), but winds in the mountains are frequently erratic. In addition, during the autumn, we get north-easterlies. These are hot, dry, strong winds. If you see smoke in front of you and these winds are blowing in your face, the fire will be coming straight at you. Put your most colorful gear on so rescuers can see you from the air, as firefighting aircraft will probably be dispatched to the blaze. Bright colors are the key. Natural colors should be avoided. If you are pretty sure you have been seen from the air, stay where you are if it is safe. Firefighters will try to come and get you if they know where you are. If you awaken to smoke-filled air, try to see which way the smoke is flowing. Use that to determine which direction to go. Do not hike toward the flow of the smoke. Do not start a “signal” fire to help firefighters locate you. The signal you just ignited can easily become another major fire. The 2003 Cedar fire in California started as a signal fire and burned 273,000 acres, killed 15 people and destroyed more than 2,000 homes. My recommendation to all my fellow trekkers is to NEVER use this method for anything. 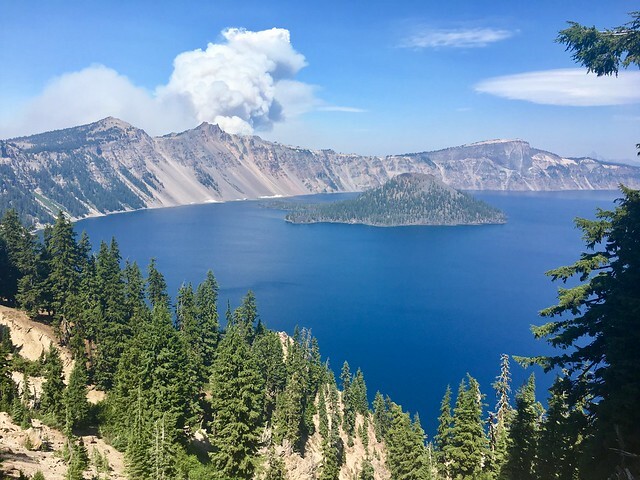 A 2018 wildfire near Crater Lake, Oregon. Photo by Briar Owen. If caught by fire where you can actually see flame, try to flee. If that is not possible, find as large a refuge as you can. Rock fields are best, the bigger, the better. Flatter is better than steep, but large, steep, rocky fields are better than brushy meadows. A flat grassy meadow where the fuel is short or still green is a good choice. Look at the denseness of burnable vegetation and use common sense. If the fuel at the bottom of a rock field is heavy (dense pine and fir trees), flames are going to sweep up the slope from that fuel. I’ve seen flames in timber over 400 feet long, so keep that in mind when picking a refuge. If there are lakes nearby, get in the water and hide behind something to protect yourself from radiant heat. If there are big rocks or islands in the lake or pond, hide behind them. The crystal clear water we love from alpine lakes does not block radiant heat as effectively as murky water will. Protect your gear on shore and leave it there. Avoid chutes and saddles at all costs. A chute is a ravine that runs perpendicular to a ridgeline and channels flames straight up to the ridge line, increasing fire intensity many times over. A saddle is a low spot on the ridge (looks sort of like a saddle, thus the name). These are sometimes not pronounced, but they have an effect similar to that of a chute. The fire is channeled toward the saddle substantially multiplying intensity. If you are hiking a ridgeline and discover fire below you on one side of the ridge, take refuge on the other side, away from the fire. Once again, look for areas of slicked off granite, rock slides, ponds, etc., to protect yourself from fire should the fire jump the ridge. This maneuver takes you out of the direct path of a fire running upslope, which is what fires normally do. If you have come around a bend in the trail and the fire is right there, don’t panic. Think as quickly as you can, take into consideration refuges you have passed, make a plan and act. Once you start moving away from danger, your likelihood of survival increases with each step. If you are at the heal of the fire or on one of the flanks, you will probably be able to hike away from it because these two areas expand much more slowly than the head of the fire. If the fire is roaring your direction, backtrack and take refuge immediately. Watch for spot fires. These are small fires in front of the head that ignite from embers dropped from the sky or from burning material rolling downhill from the fire itself. If you are trapped, once you have placed yourself in refuge, watch the smoke. Hide behind anything that will not catch fire immediately. Don’t panic as your survival may depend on it. The air is going to be hot and so smoky it will difficult to breath, but the fire side of your refuge will be many times worse. Dig a hole for your face and keep your nose in the dirt. Wildfires should never be taken lightly. They may be in our way, and they may make us hike the wrong direction, but hiking into a rapidly moving forest fire is not an adventure any of us needs without a fire engine. Smoke means there is a life-threatening event ahead, so take heed and act accordingly. With these suggestions in mind, keep hiking! A plume of smoke rises from the 2016 Gap Fire in Northern California. Photo by: Brendan O’Connor. There’s more safety information about how to deal with a wildfire on this site.